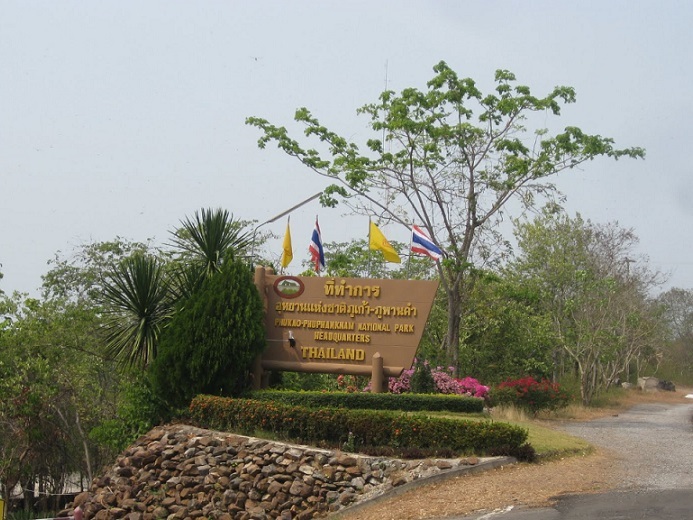 Phu Kao Phu Phan Park was established in 1985, and became the 50th national park in Thailand. It covers an area of about 322 square kilometres, so clearly far too large to explore in a short space of time. 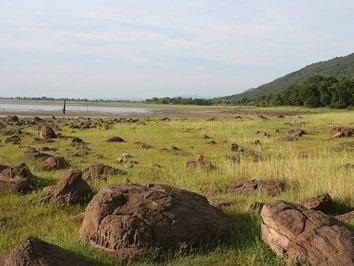 The park, which is adjacent to the banks of the Ubonratana reservoir, features two sandstone 'mountains' that are seperated from each other, and is blanketed by deciduous dipterocarp forest, dry evergreen forest, and mixed dipterocarp forest. 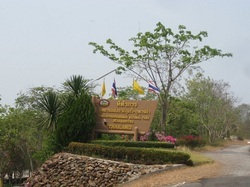 Phu Kao Phu Phan park’s headquarter is located by the reservoir of Ubolratana Dam, near Phu Khan Kham. The mountain range (part of Phu Phan Range) is on the east of Phong River Basin. If you ascend to the top of the mountain, you will get a really picturesque view of the reservoir through the valley. Phu Phan Kham is famous for fish breeding and fishing site of the province. Wat Phra Buddha Bat Phu Khao. The ancient temple houses two gigantic foot prints, one being human and the other that of a dog on the rock. Such footprints are related to local legend 'Phra Suphrom Wimokha and 9 tailed Dog'. There are Tham Muem and Tham Archan Sim caves in its compound, which houses pre-historical paintings and carving on the walls. Tham Suea Tok, Tham Chek, Tham Pla Hai. The caves here are interesting archaeological sites, housing cave paintings and carvings which date back some 1,500 years. The area is filled up with rocks in different and odd shapes. The outstanding one being one huge rock sitting on the other, resembling a mushroom, which makes it it a remarkable natural sculpture. The rock top pavilion is built on a huge rock sitting by 30 metre high cliff, and is rather incredible. It can be accessed by stairs and offers very good views over the local countryside. These small falls cascade through mixed dipterocarp forest before plunging 7 metres down into the big pool below. The park provides boats for tourist so you can enjoy the view from the reservoir. There are also three guesthouses should you want to spend several days here, and you will need to, to explore it better. 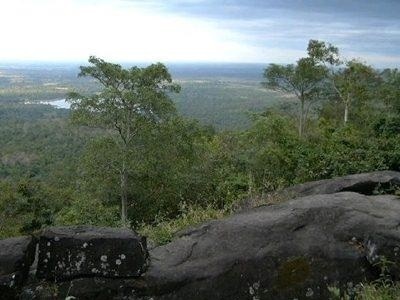 For more information, contact Phu Khao-Phu Phan Kham National Park at 08 1221 0526 or the Department of National Park, Wildlife, and Plant Life at 025 620760 or visit www.dnp.go.th The website option is probably easier for most people. 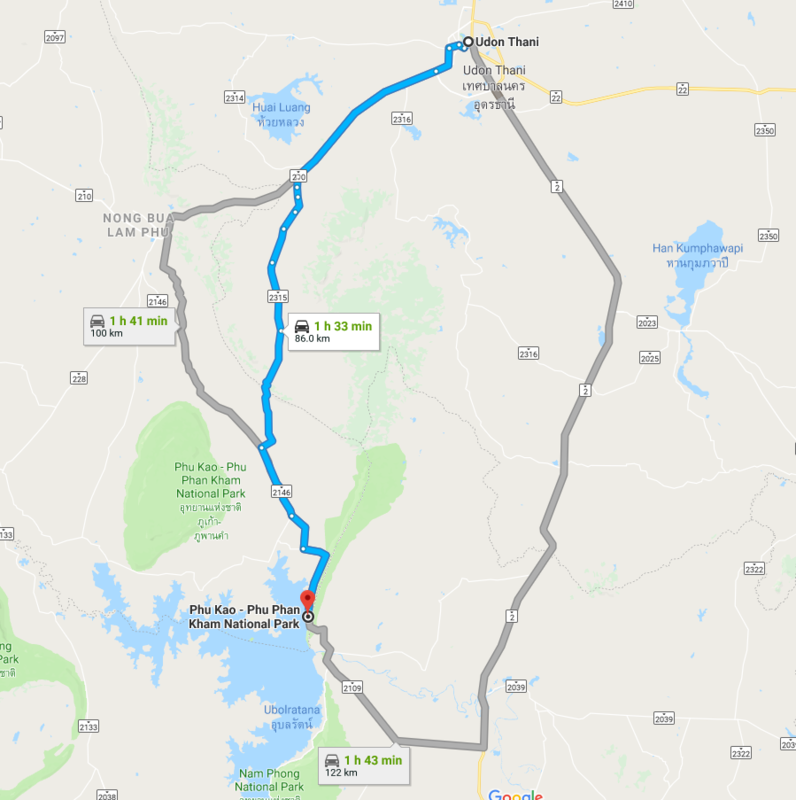 From Udon Thani, go west on route 210 to Nong Bua Lam Phu. From Nong Bua Lam Phu city, use highway 2146, towards Non Sang for 40km, turn left at Ban Sok Chan into Ban Sok Chan. The park is 14km away.